Once the ice thaws, the grass reappears and the sun shines bright, grilling season is back. After your grill has sat unused for several months, it might need some TLC. When the grill is sparkling clean, you might not want to get it dirty again. With the Simple Grill BBQ Mat, the master griller can cook up a delicious meal without dirtying the grill. 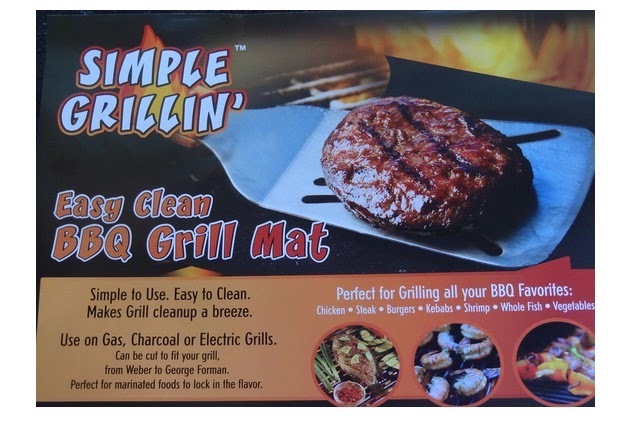 The Simple Grill BBQ Mat is an easy clean, non-stick surface that works wonderfully on a gas, charcoal or even electric grill. Each mat is 13" x 16", which can be used as a whole or cut to size. The non-stick surface is easy to clean. Instead of scrubbing the grill grates before and after each use, the Simple Grill BBQ Mat can be wiped, washed or thrown in the dishwasher. The grill master might wonder about achieving the perfect grill mark. The non-stick surface conducts heat and can create a good sear. From steaks to fish, the grill mat can help cook any item well with minimal effort. In our house, we liked the Grill Mats for kabobs and marinated fish. Usually when we grill these items, there can be large flare-ups and occasionally stuck food. With the Grill Mat, the fish and kabobs were seared on the outside and perfectly cooked throughout. Simple Grill BBQ Mat is available for purchase on Amazon.com. It retails for $15.95 for two mats. Dust off that grill and cook up a delicious meal. Simplify the cleaning with Simple Grill BBQ Mat and spend more time enjoying that delicious food. Disclosure: The reviewer received this item to review. All opinions are my own. My hubby loves to grill! This looks like it would be very helpful to have!